Red Rock Canyon State Park is located in one of several red sandstone canyons that can be found in this part of Oklahoma, and the history of this area is fascinating. The deep red-walled canyon is where the park gets its name. Comanche, Cheyenne, and other tribes reportedly camped here and outlaws hid out in the scenic canyon. With the discovery of gold in California, overland wagon trails were established, such as the California Road, which passed through the current site of the park. One of the most scenic of Oklahoma's state parks, Red Rock has camping facilities, but is probably best-known for its hiking trails and preserve of native species of plants and trees. Red Rock is the site of the last stand of native Caddo maples trees in the world. The canyon floor is home to a rich ecosystem that includes many varieties of trees, birds and animal life. Nature puts on a spectacular show of color of the Caddo maple tree during prime fall foliage viewing from mid-October through the first part of November but every season is beautiful at Red Rock Canyon State Park. Picnic areas are generously established through the park and there is a swimming pool and concession stand, open in the late spring through summer. 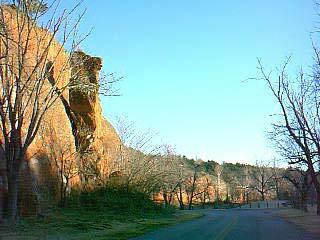 Red Rock Canyon is one of the most beautiful examples of nature's artwork in Oklahoma. Wind and water have shaped 260 million-year-old deposits from the Permian geological period into the natural sculpture you see today. A spring-fed creek still flows year-round in the canyon and large trees provide the right kind of scene for a park. For the Tenter: Red Rock Canyon has 37 unimproved, tent type campsites located in the Canyon Campground portion of the park. Each site has a parking space, concrete picnic table and ground fire grill. Water and comfort stations are located nearby. RV Camping: Canyon Campground has 5 modern (water, sewer &electric) type campsites and 18 semi-modern (water & electric) type campsites. California Road Campground has 28 semi-modern (water & electric) type campsites, one of which is a handicap R V campsite with 50-amp electric service, and 4 of which are pull-through. Red Rock Canyon State Park welcomes R V Clubs and Groups. For these groups we offer the California Road Campground as a reservation area so all participants can camp together in one campground. The park has 4 conveniently located modern comfort stations with hot showers and flush toilets. There is an RV dump station located in the park. Some discounts off camping fees are available for RV organizations, senior citizens (limited) and disabled campers. Please ask the park office or park rangers for details. Other features include a small 1/4 acre pond, a handicapped accessible swimming pool with a bathhouse, a concession stand, a playground, a volleyball court, several unmarked hiking trails along the canyon sides and rim, and two short interpretative nature trails: the Rough Horsetail Trail (interesting variety of plant life) and the California Road Trail (wagon tracks can still be seen). Fall is an especially auspicious time to visit when the trees in the canyon display their colors. From rock climbers to armchair geologists, visitors will find Red Rock Canyon State Park an appealing destination. The swimming pool is located in Canyon Campground. The pool is open from the Memorial Day holiday weekend through the Labor Day holiday weekend. Regular days of operation through the week are Tuesdays through Sundays, closed on Mondays. A fee is required to swim. Season swim passes are available. Red Rock Canyon features two wonderful nature trails. The Rough Horsetail Nature Trail is located in the Caddo Maple Conservation Area portion of the park at the bottom of the steep entrance hill. This 0.4 mile loop trail is marked with interpretive signs. Trail difficulty is mild. The California Road Nature Trail is located in the California Road Campground. It is a 0.2 mile round trip dead end trail that takes you to a beautiful canyon overlook. The trail has an information display at the trailhead. Trail difficulty is moderate, due to the steep incline of the trail. Caution! While hiking is permitted along the canyon rim, there are no maintained hiking trails in that area. The sandstone around the canyon rim can be very unstable and slippery and extreme caution is advised. It is recommended that you stay away from the canyon rim itself. Red Rock Canyon is one of the most popular rappelling sites in Oklahoma. Visitors must bring their own ropes and gear and use the park's canyon walls at designated rappelling sites only to participate in this exciting activity. Rappelling is done at the visitor's own risk and could result in serious injury. Ropes and other gear are not available for rent or use from the park. From the surrounding rolling plains, the canyon itself is about 150 feet deep. The vertical canyon walls and overhanging cliffs seen from the canyon floor are as much as 60 feet high but are generally 45 to 50 feet in height. The tallest vertical canyon wall, located as the backdrop wall to the pond, is 74 feet at its highest point. Red Rock Canyon became a landmark on the California Road, the pioneer trail that led westward from Ft. Smith, Arkansas to Santa Fe, New Mexico. During the 1849 California Gold Rush, it was a haven for weary travelers. The canyon provided fresh water, grazing for livestock and a place to rest and repair their wagons. The discovery of gold in California occurred in January 1848. When reliable news reached Americans in the East and was widely published in newspapers and gazettes in the fall of 1848, the country went wild with gold fever excitement. All across the land people dropped what they were doing and prepared for the adventure west � CALIFORNIA OR BUST! There were several ways of traveling to the gold country. The sea voyage took prospectors either by way �around the horn� of Cape Horn, Chile, South America, or by way across Panama and Nicaragua of Central America. Both sea routes terminated in San Francisco, the jumping off place to the gold fields. The land voyage took prospectors overland by northern routes such as the Oregon Trail, Morman Trail, and the Santa Fe Trail. Less well known was a southern overland route called the California Road Trail. The trail started at Ft. Smith, Arkansas, followed the south bank of the Canadian River (South Canadian River today) through Indian Territory (Oklahoma), then across the Staked Plains of the Texas Panhandle and on to Santa Fe, New Mexico. There the trail connected with existing Spanish trails traveling west to California. This southern route along the Canadian River had been known for many years previous to the gold rush. It was an established trade route through Indian Territory. American explorers included Stephen H. Long (1821), Josiah Gregg (1839-40), and Nathan Boone (1843). The Cherokee scout, Jesse Chisholm (1839) was also familiar with routes through western Indian Territory. Captain Randolph B. Marcy led a party of about 500 settlers west in 1849. He commanded 80 soldiers from the 1st Regiment of Dragoons and the 5th Regiment of Infantry. They used the famous Delaware scout Black Beaver to guide them on their way. This party left Ft. Smith in April and reached Santa Fe on June 28, 1849. Edward F. Beale used this California Road Trail in November 1858 as he surveyed a proposed route for a railroad to Santa Fe. This railroad was not built because of the Civil War. After the Civil War, the California Road remained an active and important road west until railroads were finally built through Indian Territory in the 1880's and 1890's. The remains of the abandoned Chicago, Rock Island and Pacific Railroad roadbed makes up the west boundary of Red Rock Canyon State Park. The roadbed can be seen at the end of this nature trail. Today, the California Road trail ruts remain as a monument to an important episode in the development of the United States. Red Rock Canyon has a fishing pond located in Canyon Campground. The pond is stocked locally with Largemouth Bass, Catfish and Bluegill. Lots of fun for anglers of all ages. An Oklahoma Fishing License is required for those 16 and over.